I really love travel souvenirs and I have been traveling all my life. In the past, I have collected postcards and shot glasses, hankies and Christmas ornaments. And of course, patches. Once I began to letterbox as a hobby, I enjoyed getting patches from all the places where I had been hiking and letterboxing. Each time that Ryan and I would go on a trip, I would get a patch to commemorate the event. I filled up my first backpack in record time. The LBNA (Letterboxing North America) patch is proudly displayed on the front of the pack, along with patches from many National Parks and our trips to Central America. I also have smaller patches to fill in space. Some of these are trail patches from the National Parks representing different trails. Some of them are Girl Scouts and Boy Scouts patches that I bought at antique shops or on Ebay. And the little orange patches with F100 and P100 represent "merit badges" from letterboxing. They mean that I have Found 100 letterboxes and Planted 100 letterboxes. 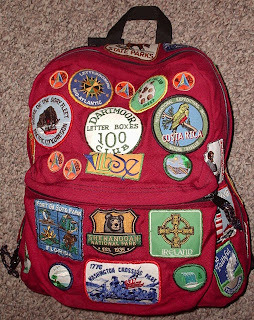 The second backpack that I covered with patches has my Dartmoor 100 club patch displayed front and center! It was quite an accomplishment to find 100 letterboxes in Dartmoor, England last year and I am very proud of that patch. This backpack also has patches from many of my international travels: Ireland, Holland and Scotland. It also sports my letterboxing Pacific Northwest, Letterboxing Southeast and Letterboxing Mid-Atlantic patches. Again I used smaller Girl Scout patches and Letterboxing Merit Badges to fill in space on the backpack. The third backpack that I just finished sewing patches onto has the Atlas Quest patch front and center. This patch represents my boyfriend, Ryan's letterboxing website. 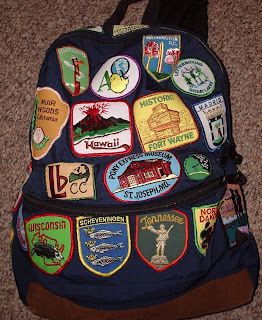 The bag also has patches from our most recent letterboxing trips to Hawaii, Nebraska, Kansas and Missouri. 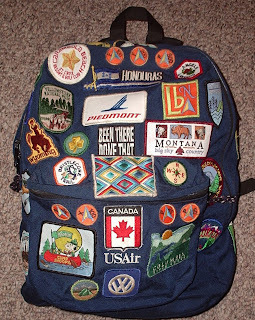 I still have a drawer filled with patches that I will start sewing onto a fourth backpack. There are several states and countries that I hope to visit in the future for more hiking and letterboxing adventures and patches! Hike-a-thon pledges are up to $720 from 17 people! With the letterboxers still outshining the flight attendants. Thanks so much to everyone! Most of you who have seen my boyfriend, Ryan stamped into a letterbox know that he signs his little Turtle with a Moo voice balloon. So that is behind the "Mooving on Up" of the title of this post. Silly, I know, but we have had a busy two days moving Ryan's gear from Portland, OR to Seattle, WA. From Storage to Storage. and I might be a little punchy. It all started yesterday morning with a 3 hour drive down to Portland in my little VW. We stopped in Centralia for a Burgerville hamburger and shake. I love this restaurant chain and the closest one to Seattle is an hour and a half drive away in Centralia. They use all local ingredients in their products. So I had Walla Walla sweet onions on my burger (and fried up as onion rings too) And the cheese on the cheese burger is local Tillamook Cheese. The fruit for the shakes right now is Oregon Raspberry. This changes throughout the year with whatever is in season. Yum. 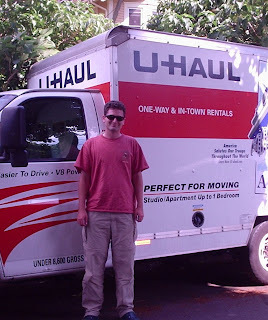 We arrived in Portland and Ryan picked up his rental truck. The 10 footer. "Perfect for Moving" it says on the side of the truck. I was envious, because Ryan would now have air-conditioning for the drive back to Seattle. Ryan had been storing his belongings in the basement of a friend's house in Portland, so we drove over to start moving his stuff out. It only took a couple of hours to get the stuff moved and then his friend Nancy made us dinner. She grilled steaks. After all, it was also a birthday celebration! Today, July 14th is Ryan's Birthday. The next morning bright and early we joined the rest of West Seattle and set up for a little yard sale. 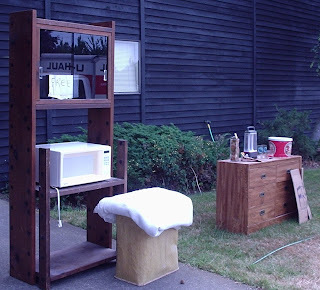 But in this yard sale we had more things for FREE than for sale! :-) It is amazing, but people sometimes don't want to believe that you are giving away something of value for free. There must be something wrong with it or some sort of catch. One lady took several free items and then insisted on giving me a dollar. "for my time" she said! 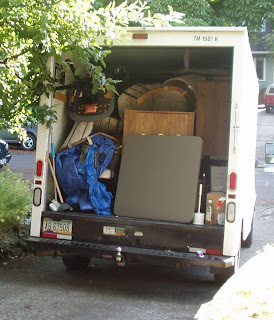 Mainly we had to get rid of stuff because we had to take a full 10 foot truck and squeeze everything into a 5x6 storage space. Ryan and I had lots of duplicate items. You really don't need two microwaves in a one bedroom apartment. Or even two spice racks. Also there were several pieces of furniture that we just did not have room for...some tables and chairs and bookcases. Other household items like blankets and even a lamp or two. We sold enough to buy ourselves lunch at the Charlestown Street Cafe a couple of blocks away. And the rest went into the 5x6 storage unit. There were still a few items left at the end of the afternoon, but hopefully Goodwill will take them. Many thanks to some of our letterboxing friends who came down to take some stuff off our hands! 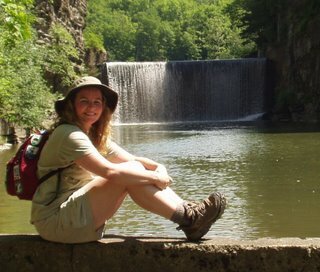 For those folks looking for some hike-a-thon information in this blog, I have $350 in pledges from 11 people so far! Last year the flight attendants pledged more than the letterboxers, but this year I think the letterboxers are set to make up for it! I have had almost all the pledges from letterboxers so far. Hurrah. I will be happy to give a book to everyone who pledges money for the WTA hike-a-thon. I am weeding out my library and getting rid of all my John Sandford and Nevada Barr books this year. Night Prey, Mind Prey, Secret Prey, Certain Prey, Easy Prey, Chosen Prey, Naked Prey, Hidden Prey, and Broken Prey. Superior Death, Firestorm, Blind Descent, Deep South, Blood Lure, Flashback, and High Country. Thanks to everyone who supported me last year for the Washington Trails Association hike-a-thon. I raised over $1000 for Washington Trails! This year I want to try and at least match that again. 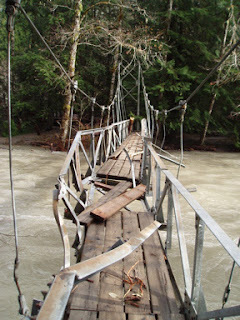 For those of you who don’t live in Washington State, we had a lot of storm damage last fall to our wilderness areas. Statewide the damage estimates top $70 million and are expected to grow as the high country snow melts and more instances of damage and wash-outs are uncovered. 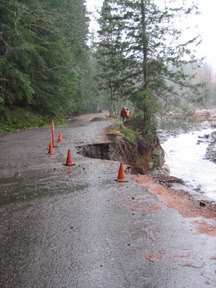 Mount Rainier and Olympic National Parks were hit very badly. 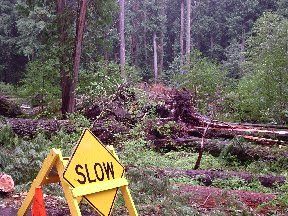 Many roads, bridges and trails have been washed away and damage from trees down has closed access to many trails this summer. Instead of participating in Hike-a-thon this year, my boyfriend Ryan is actually getting his hands dirty and volunteering for WTA repairing trails. For two weeks in August, he will be working to repair sections of the Pacific Crest Trail in the Cascades Mountains. I have a day job, so I will be hiking on my days off for Hike-a-thon 2007 and collecting pledges to support Washington Trails. All the dollars pledged go directly to protecting and maintaining trails here in Washington State. They really need your help this year more than ever! I am seeking pledges for my hiking. You can pledge a flat donation, such as $50 or an amount per mile, such as $1 per mile. Any contributions over $35 will be eligible for Washington Trails Association Membership. 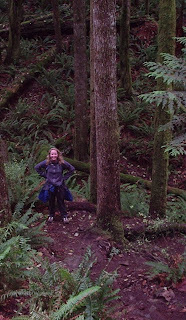 (With membership you receive a Washington Trails Magazine) This is a great little magazine and has many interesting articles on the trails in Washington and also general articles on topics such as backpacking with children and reviewing camping gear etc. All donations are tax deductible. And every little bit helps! Last year I had pledges as low as 10 cents per mile or a flat $5. It all adds up. Last year pledges of $10 or more got VHS and DVD movies that were set in Washington State. This year I am pruning my book collection. Specifically, I have books from two of my favorite authors, John Sandford and Nevada Barr, to give away to each person who pledges money for WTA. I plan to give out the books randomly, but if you are looking for a specific title from one of these authors, let me know when you pledge! I will have a blog up on the internet detailing my hiking and pledges.